Time to start the discussion of our next novel from The Bestseller Code 100 list, The Martian by Andy Weir. Summary: When a freak accident leaves astronaut Mark Watney stranded alone on Mars with no one aware that he survived, his chances of making it back to Earth safely are nonexistent. That, however, doesn’t stop the rebellious mechanical engineer and botanist from figuring out how to survive. 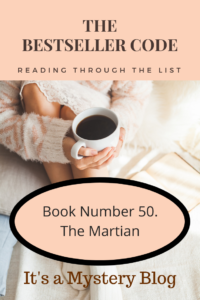 Have you read The Martian by Andy Weir? We’d love to hear your thoughts. Have you written about The Martian by Andy Weir? Feel free to add a link to your review in the comments.